The editorial team is pleased to publish Volume 5, Issue 1, and overall tenth instalment. This issue features articles covering both colonial and contemporary formations of ethnic politics in Sri Lanka; the Madheshi uprising, Tharuhat movement, and ethnic politics in Nepal; and in India, a study of regional folk stories found in various vernacular expressions of the Mahābhārata; Cold War-era politics in Kerala; and the role of Sikh refugees in ethno-nationalism in the Indian Punjab. This issue also features the first ever international academic journal collection devoted to the study of contemporary Naga society, and we hope this may inspire future scholarship on the Naga indigenous communities in the Indo-Burmese borderlands. The South Asianist is proud to publish its articles as open-access, which, among many other advantages, has the pivotal benefit that articles are easily downloadable by respondents and interlocutors. The classic South Asianist cover design is by Heid Jerstad (former co-editor) and artist Lauren Lee; and this issue's cover image is a photograph taken in 2014 by British anthropologist Edward Moon-Little, of an elder Naga woman from northern Nagaland state with a distinctive facial tattoo. 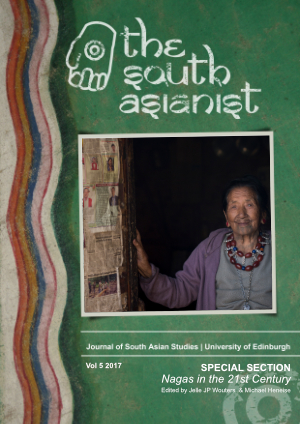 The South Asianist is an Open Access journal published by the Centre for South Asian Studies, University of Edinburgh. All material is licensed under a Creative Commons Attribution-NonCommercial-ShareAlike 4.0 International (CC BY-NC-SA 4.0) licence, unless otherwise stated.